Have you ever thought about the quality of the air you’re breathing at home? The average adult spends 90% of their time indoors (! ), so it’s imperative that the air we’re breathing isn’t full of toxic chemicals. But according to the United States Consumer Product Safety Commission (CPSC), the air quality in our own home can be more polluted than the air outdoors, even for people who live in large, industrialized cities. And what’s worse, most homes have multiple sources that contribute to air pollution. This includes household cleaning products, wet or damp carpet, building materials and furnishings, heating and cooling systems, to name a few. So what kinds of pollutants are we talking about here? Formaldehyde, lead, pesticides, radon and asbestos are just a small handful of the pollutants many of us are exposing ourselves to in our home. Needless to say, these pollutants can cause serious short and long-term health issues. Fortunately, there are a number of things you can do to improve the air quality at home. These range from simple, inexpensive solutions all the way to up more expensive, but incredibly beneficial options. The cheapest and easiest way to improve the air quality in your home is to open your windows and let the fresh air in. When our windows and doors are constantly closed, fresh outdoors air is unable to enter and replace indoor air. This creates an environment in which pollutant levels start to increase. Instead of turning on the air-conditioner when the temperature starts to rise, open the windows, turn on the ceiling fan if you have one, and enjoy the fresh air and cool breeze. And here’s another good habit to start: open the windows every morning, take a deep breathe and invite some fresh air into your home! In the late 1980’s, NASA and the Associated Landscape Contractors of America conducted a study to determine the most effective house plants to remove pollutants from the air. The results of the study, know as the NASA Clean Air Study, showed that certain indoor plants have the ability to remove environmental toxins from the air, including formaldehyde, benzene, and trichloroethylene. There are some culprits of indoor air pollution that are extremely difficult, if not impossible, for us to eliminate entirely. But one of the simplest to eliminate is toxic cleaning products. 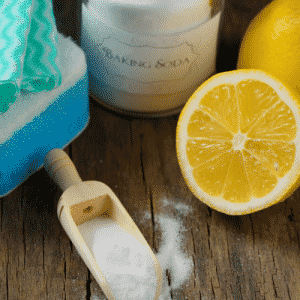 If you’ve ever read the ingredients list of most store-bought cleaning products, you’d be shocked at the toxic ingredients. Many of the ingredients found in these cleaning products are known to cause serious health problems including cancer and respiratory issues, and using these products in the home introduced a whole host of pollutants into the air. The good news is, it’s very simple and cheap to switch out your cleaning products for greener alternatives (and they work just as effectively.) Here’s a list of 10 DIY Green Cleaning Recipes that work like a charm. Another cheap but effective way to improve your indoor air quality is to buy some Moso bags. Moso bags are natural air purifying bags that also help to eliminate odors in the home. The exterior of the Moso bag is linen, and the inside is filled with 100% bamboo charcoal, which absorbs impurities in the air. Moso bags are incredibly simple to use – just place the bag wherever you’d like (moist areas like the bathroom is a good place to start.) Then once a month, place your Moso bag outside in the sun to reactivate. Moso bags last for two years, at which point you can cut them open and use the charcoal as plant food in your garden. Here’s where you can buy Moso bags. Radon is a radioactive, colorless, odorless and tasteless gas that is naturally occurring. Radon is the leading cause of lung cancer in non-smokers. Unfortunately, because you can’t see or smell radon, the only way to find out of radon is present in your home is by ordering one of these test kits or hiring a professional to come to your home and test for the presence of radon. If radon is found in your home, this article has some excellent tips on how to reduce radon levels in your home. This is the most expensive solution on the list, but because of their effectiveness at improving air quality in the home, a high-quality air purifier is worth the investment. HEPA Filters – High Efficiency Particulate Air Filters (HEPA) remove 99.7% of dust, pollen, smoke, odor, pet dander, mold spores, and other small particles and pollutants found in the air. It’s important to note that while HEPA filters are incredibly efficient at trapping particles that are 0.3 microns or larger, they are generally not effective at removing gas, fumes and chemicals. It’s recommend that you use a HEPA filter in conjunction with an activated carbon filter. Activated Carbon Filters – these air filters use activated carbon (also known as activated charcoal) to absorbs gas, fumes and chemicals. Naturally, the best option for an air filter is something that combines the two, and fortunately, that does exist. It’s called an AirPura UV600 and while it’s expensive, it’s the best option for reducing the majority of forms of indoor air pollution. Learn more about the AirPura UV600 here.